So it’s no secret that I’m none too thrilled with the state of my skin. But neither am I willing to spend a bazillion dollars on creams and lotions for it. I guess the bottom line is, I just don’t believe that it makes all that much of a difference which product you use – so why spend a fortune. My friend (and prom date) Billy Kolber, from Billy Knows Best, thinks otherwise. He’s been an Avon Man for years, (f you click over to his site, he happens to have an Avon post up right now!) and he insists that Avon spends more on product research than just about anyone, and their products are therefore more effective and better overall. Plus, they give a lot back to women and the community. Not bad. Anyway, because Billy really does know best a lot of the time, I decided to try out Avon’s latest best product ever (they seem to call every new product the best one ever). 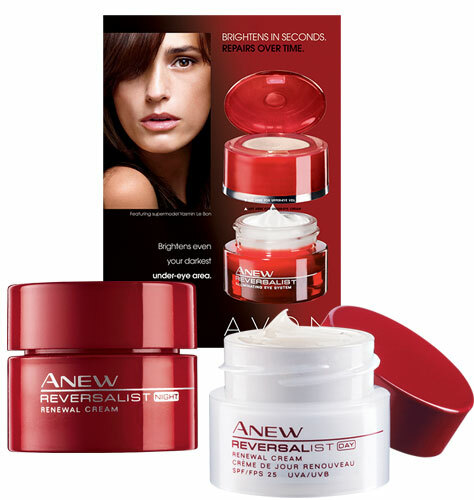 It’s called Reversalist, and here’s what Avon has to say about it on their website. First off, may I just say: Avon people: you need a proof reader, or at least someone with minimal grammatical knowledge writing your stuff. The little paragraph above has a few weird punctuation things, and the part of it I didn’t use has such an awful, incomprehensible sentence in it that I’m hoping it was just an typing error. Seriously Avon — you’re huge. Spend a few bucks for someone with a college degree. Bottom line: I bit the bullet and bought the four products that are the base of the Reversalist system: Serum, Day Cream, Night Cream, and Eye Cream, and I really do see a difference. My skin immediately felt incredibly smooth. Weirdly smooth. But good. That degree of smoothness didn’t last forever, but I think that for at least several hours after applying it, my skin has a sort of sleek feeling that I’m sure it once had, but I was too young to appreciate! But the biggest thing is the eye cream. The thing that’s upsetting me the most lately (skin wise, anyway) is how splotchy I’ve become. Nothing says aging hag more than a bunch of brown spots on your face. And my eyes? I look like I’m wearing permanent brown eyeshadow….and not in a good way. After three weeks of religiously using the products, I can honestly say, the discoloration on my lids is noticeably better. (at least to me) The giant age spot on my nose? Not so much. But I’ll take what I can get, and brighter eyes make your whole face look younger. As for wrinkles, I guess I can’t really say. I’m not particularly wrinkled (finally, an upside to having oily skin and acne in my teen years!) but I do think that overall, my skin just looks and feels…better. My neck is pretty much past redemption – but that’s what turtlenecks and scarves are for. I do find that a lot of products work for a while, and then as your skin gets used to them, they don’t work anymore (totally unscientific, just how I think it happens). So it’s possible that in three months, I’ll be right back where I started. But for now: this stuff works. Really. When I bought it, it was a starter kit, but I had to buy full sized products. I just checked the website, and they are selling a sample size starter kit with everything but the serum. So why not give it a shot? For $10 it isn’t a big risk, and you’ll get enough product to see if it works for you. Oh, and one more thing, just to be clear: I didn’t get ANY freebies for writing this. I have no relationship with Avon whatsoever. I bought everything with my money, and wanted to put in my own two cents. Let me know if you like it — or if you have a not ridiculously expensive product that you think works. I need all the help I can get.